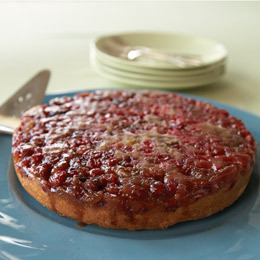 Topped with tangy cranberries in lieu of sweet pineapple, this recipe lends a distinctive New England flavor to old-fashioned upside-down cake. To be sure you’re using the freshest berries, you’ll want to choose fruit that has bounce in it. Or you can put it to the water test. Small pockets of air trapped in fresh cranberries make them bounce — and float in water. 1.Heat the oven to 350°. Melt 2 tablespoons of the butter and pour it into a 9-inch springform pan. 2.In a mixing bowl, combine the cranberries and the brown sugar, then scatter the mixture atop the butter. Sprinkle on the pecans. 3.Beat the remaining 4 tablespoons of butter and the sugar at medium speed in a medium mixing bowl until well blended. Beat in the eggs one at time, then beat in the vanilla extract. 4.Combine the flour, baking powder, and cinnamon in a small bowl and stir well. Beat a third of the dry ingredients into the creamed mixture, followed by half of the buttermilk. Continue alternating in this way until you’ve beaten in the last of the dry ingredients. Spoon the batter evenly over the cranberries. 5.Bake the cake until a wooden toothpick inserted in the center comes out clean, about 50 minutes. Let it cool in the pan for about 5 minutes, then invert the cake onto a serving platter and remove the pan. Serves 10. 1.In a medium saucepan, melt butter over medium heat. Cook and stir almonds in butter until lightly toasted. Remove from heat, and let cool. 2.In a large bowl, combine the spinach with the toasted almonds and cranberries. 3.In a medium bowl, whisk together the sesame seeds, poppy seeds, sugar, onion, paprika, white wine vinegar, cider vinegar, and vegetable oil. Toss with spinach just before serving. Crumble and brown ground beef in a large skillet. Drain ground beef and add taco seasoning according to directions. Heat according to package. Set aside. Heat refried beans in the microwave in a microwaveable dish. On a large sided cookie sheet layer tortilla chips, refried beans, ground beef, lettuce, tomatoes, sour cream, guacamole, olives, salsa, and cheese. Or you can layer all ingredients in a dish and set the chips aside for dipping. Great tasting and easy!